A few years ago, I tried listening to an audio book, but it never went well. Since then I have avoided them. However, since becoming a blogger, they have come on my radar often so much so they have become impossible to ignore. When I discovered I had access to some popular audio books as a prime member I decided to once again venture in to the world of audio books. Mind you, I took awhile to take the plunge, but I eventually did it. I am not at the point where I can do other tasks while listening, but I hope to get there soon. My experience this time around was not bad in fact, it was better than I expected. 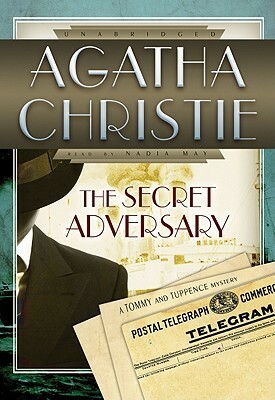 For my reintroduction to the audio book world, I chose The Secret Adversary by Agatha Christie. It is the first novel in the Tommy and Tuppence (Young Adventurers series). Set in post WWI period, it tells the story of two young people who embarked on a business venture, to make money, which would plunge them in a world of espionage and intrigue. This is not my first Agatha Christie book so I am familiar with her writing style. Her stories start out on a slow note and gradually builds up to where you are on the edge of your seat, trying to figure out the villain’s identity and what will be his next move. The Secret Adversary was no different. I thought the mystery was well done. It had me guessing the identity of the villain. There were two suspects, but trying to figure out the real villain was not that simple. The story, although flawed was fun and enjoyable. It lacked the credibility one would expect from a true espionage tale. I had questions about the government documents, which started this whole adventure. What was written in the documents? It would have been nice to know. Tommy and Tuppence worked well together. They made a great detective duo. They complemented each other. Tuppence was a lot of fun. Not afraid to speak her mind, which is refreshing for a heroine depicted in the post WW1 era. It is evident they were childhood friends, however beyond that there wasn’t much background information about them. I found the author’s description of her main characters refreshing. She viewed Tommy as unattractive, not very smart and a bit on the boring side. While she saw Tuppence as being average. It has been said that the narrator can make or break a story. Now when it comes to narrators I am no expert, but I thought Nadia May did a great job with this title. How she captured the character’s voice was on point. The voices, accents, (French, British, German, Russian and American) and the pacing were well done. I felt she captured the characters personalities and idiosyncrasies well. She made it easy for me to know which character was speaking at any point in time. The Secret Adversary is a light-hearted and entertaining listen, which provides an interesting and brief view of the mood and fears during the postwar WW1 era. Not my favourite by Christie. But I would still recommend this title. "TO ALL THOSE WHO LEAD MONOTONOUS LIVES IN THE HOPE THAT THEY MAY EXPERIENCE AT SECOND HAND THE DELIGHTS AND DANGERS OF ADVENTURE"
Just after World War I, Tommy Beresford and Tuppence Cowley are desperately short of money. With a shortage of job opportunities, they form a partnership, hiring themselves out as "young adventurers, willing to do anything, go anywhere." In their first dangerous assignment, they must use all their ingenuity to save not only their own lives but also the life of a mysterious girl. The girl in the photograph has been missing for five years. Neither her body nor the secret documents she was carrying have ever been found. Now postwar England's economic recovery depends on finding her and getting the papers back. But the two young Brits working undercover for the ministry, Tommy and Tuppence, know only that her name was Jane Finn and the only photo of her is in the hands of her rich American cousin. They don't yet know about a mysterious and ruthless man called "Mr. Brown" or the beautiful but sinister older woman who knows all about Jane Finn--and therefore must die.